The full kit comes with one mod and one atomizer. Introducing the Aspire Plato. An all in one personal vaporizer and tank system that fits in the palm of your hand. The Plato brings you temperature control and normal wattage mode up to 50 watts along with adjustable airflow, but that isn't all. This little marvel also has multiple coil options so whether you enjoy a mouth to lung style or a direct to lung style the Plato has you covered. Simple but complete. 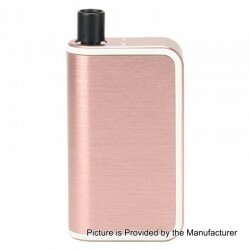 The mod kit comes with 1 x 18650 battery.